I think I just got too excited yesterday. 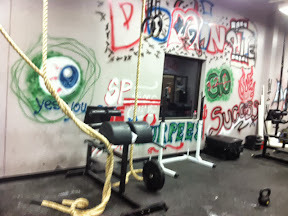 I signed up for CrossFit as you all know if you read yesterday’s post and I was ready to do my first class right that second. Since I am a beginner I have to go at scheduled times for now and make sure someone is watching me to make sure I am doing all the lifts and moves correctly, so no impromptu workout last night. No, instead I joined CrossFit and then had to go home and spend the rest of my night getting ready to CrossFit. Most of my stuff was already packed up and ready to go but I had a few last minute things to get ready. I had to have my early morning CrossFit things ready but then my clothes for the day and then my Running Bootcamp clothes for the afternoon. I knew I was going to have a busy day. I was good and got in bed just before 9pm, don’t judge I had a 4:15 wake up call. I laid in bed for a while and couldn’t go to sleep. I was excited about the new workout and scared all at the same time. What if I couldn’t do some of the exercises? What if, what if, what about? This went on for 3 hours…. I could not fall asleep. I was so excited I didn’t want to wait but so nervous I couldn’t go to sleep. The last look at the clock was just before 1am. 3 hours of sleep would never be enough to get through this. I remember this same thing happening the night before my Marathon. I could sleep to save my life. I tossed and turned. Last night I actually got up and grabbed a handful of Cheerios and a string cheese cause I was up for so long that I got hungry. AND I NEVER GET UP IN THE NIGHT!! When my alarm went off I popped out of bed. Don’t worry, 3 hours of sleep is plenty. I grabbed my gear and made it out the door in record time. I didn’t want to be late on my first day so I tried to leave a few minutes earlier than normal. I was so excited on my way to the gym that I was actually smiling as I was driving down the road, when I realize it I got tickled in my car and then realized that I was a crazy person who was smiling and laughing at herself while driving down the road at 4 in the morning. This is where the magic happens!!! You do this 10 times, decreasing the row, increasing the Kettlebell swing. It was T-O-U-G-H! I was sweating instantly it seemed like. I like the rowing machine but I was having to pull harder than I have ever to get the burn and the RPMs where the teacher suggested, and I barely got there on the first couple and it just got worse from there. 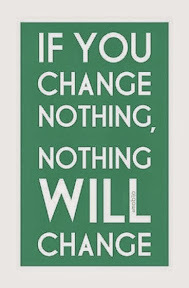 About the 7th trip around the gym I switched to a 25lb weight because it was lower the weight or DIE! I finished it, the whole workout with very little modification (only lowering the weight on the run) in 1 hr 9 min. From what I hear most of the workouts are around 30 minutes so I thought I was misinformed but then I heard all the other people telling us that THIS was the hardest one they had done….really?!?!?! on my first day, of course! The fastest time was 55 minutes so I wasn’t that far off. I have learned a few things already…. a. If you are an incredibly competitive woman don’t stand next to the men, I wanted to put more weight on my bar cause I could lift that! My gosh, no I can’t! b. These might be my people, the swore, they grunted, the sweated, nothing like the Barre experience I had. Not one person checked their fingernails for the entire workout. I already can’t wait to go back again. I think a changes it exactly what I needed, whether this was the right change or not I don’t know yet, but I liked the excitement that I felt when I woke up this morning. That excitement has been lacking the last few weeks. I know this is still very brand new and it might not be the right fit, but right now it’s the motivation I need. 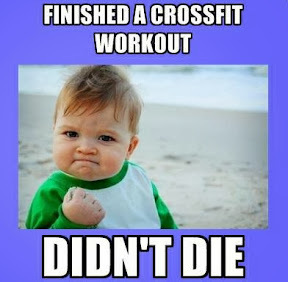 Now that I have spent 90% of my post talking about CrossFit I will tell you about the rest of my day. I had Running Bootcamp after work and its been a while since I have been on a run so I was thinking this was going to be a disaster. Turns out that taking a break makes me run better. The boot is finally off my running buddy's foot so we had some catching up to do. We haven't gotten a good run/talk in 2 weeks. So we kinda stuck together. He is still struggling with a sore foot and we needed to talk so we moved a little slower than the rest but I got an amazing workout. Bootcamp was hills hills hills tonight. We climbed the biggest hill 10 times. We climbed until my legs were shaking and then went up a few more times. I was pouring sweat and ready for it to be over. My legs were slightly fatigued after the morning workout. I got in the car and headed home and then my night exploded. I need to be in bed early tonight because I have to be up early again but that just wasn't in the cards. I had to pick up my bridesmaid dress at the seamstresses, I had to get stuff ready for our fundraiser for tomorrow to raise money for our St. Jude Hero Marathon, and at 8:30 I finally got home and still hadn't had a bite to eat since lunch. So now I have caught the season premier of Biggest Loser while I was getting ready for tomorrow and even done all my laundry since I wore both my sports bras today. Now if I can just catch some Zzzz's tonight! 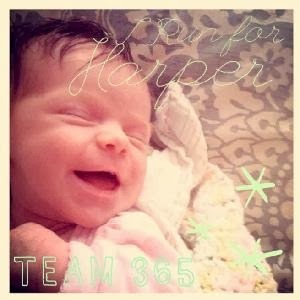 And please don't forget to support Team 365 in raising money for St. Jude Children's Hospital in Honor of Harper. You can click here to support our team with a donation or to join Team 365 to run the half or full Marathon in Nashville in 2014! 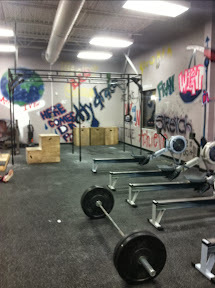 glad we survived and enjoyed day 1... (remember i'm living through you on this crossfit thing). disappointed they didn't show much of bob's crossfit workouts last night.. I'll give you more info than you want probably!